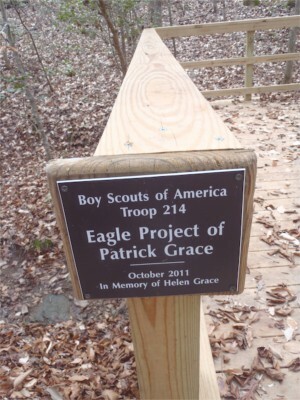 This stretch of the trail is full of bridges, benches and other other Eagle Scout projects. A popular stretch of trail due to its location within Wake County’s Blue Jay Point County Park. Because the park’s main attractions — playgrounds, ball fields, picnic shelters — are at roughly the midpoint of the trail, you’ll see a fair amount of traffic hereabouts, especially families with small children. The southern end sees a good number of fishermen who use the parking off Six Forks for quick access to accessible water. The north end of this trail sees little traffic. No overnight camping is allowed. This stretch probably has more benches per mile than any hiking trail you’ll ever tread. Thank a local Eagle Scout if you’re compelled to take a rest. You’ll also encounter a nice platform nestled in a cove more than a mile in, a popular spot for spring wildflower viewing. Several feeder trails offering quick to access the lake. Plan to work in a visit to Blue Jay Point (park hours are 8 a.m. until sunset). In addition to the various recreational amenities, you’ll also find water and restrooms. Geology Highlights: While hiking this trail section, be on the lookout for distinctive minerals: talc, chlorite, actinolite, magnetite and serpentine. These are characteristic of the ultramafic rocks of the area. Cross a graveled, blue-blazed trail, Blue Jay Point Trail (R leads to park’s namesake, Blue Jay Point). After passing by a split rail fence, cross a small footbridge and turn R to stay on the trail (Red-blazed trail turns L to head uphill to a playground and restrooms). Stay R at a junction with the yellow-blazed Laurel Loop Trail, L, as the trails run concurrently on a wide footpath. Reach the wide blue-blazed Sandy Point Trail and turn L with this for about 100 yd, as the Falls Lake Trail turns L onto a narrower footpath. Reach a signboard by a parking area and turn R to cross a park road to reenter woods. After a descent to the lake, cross 2 footbridges, with a bench between them. Cross another footbridge by the end of a cove.